Something you may not know about me: I am a scarf hoarder. I am also a regular hoarder- hoarder, minus the raccoon skeleton behind the fridge. And I can see my floor. Today, at least. But anyway, back to scarves…I have a lot. Last March I set about hand-washing all the silk ones in a single day and I counted 176. That does not account for the additional handful of cotton, wool, and polyester scarves I keep tucked in drawers around the house. All-in-all, I probably own somewhere around 200. And I buy more all the time. Half of them are from the thrift store, but plenty are new. I love to give scarves as gifts too, and likewise, many of my favorite scarves have been gifts from other people. If you know me in real life and have ever had occasion to buy me a gift, there’s about a 70% chance it was a scarf. Amiright? (And, you know, I love it). With this in mind, you can imagine how thrilled I was when Scarves.net got in touch and asked me to design an easy DIY using one of their scarves. This is sooooo up my alley. In fact, this isn’t up my alley, this IS my alley. From here on in my alley is renamed CAT LADY DOING WEIRD THINGS WITH SCARVES STREET. For this project, I designed a summer shrug, which is somewhere between a beach cover-up and an outtake from Mrs. Ropers wardrobe. It’s rad. It’s easy. It’s chic. I wore it to work and to a fancy event and got oodles of compliments both times. Looks good with big jewelry, and it’s great for more modest, small jewelry moments when you want to cover your shoulders (like Church). Best of all, no more boring cardigans in August. Thank you, Bajeebus! 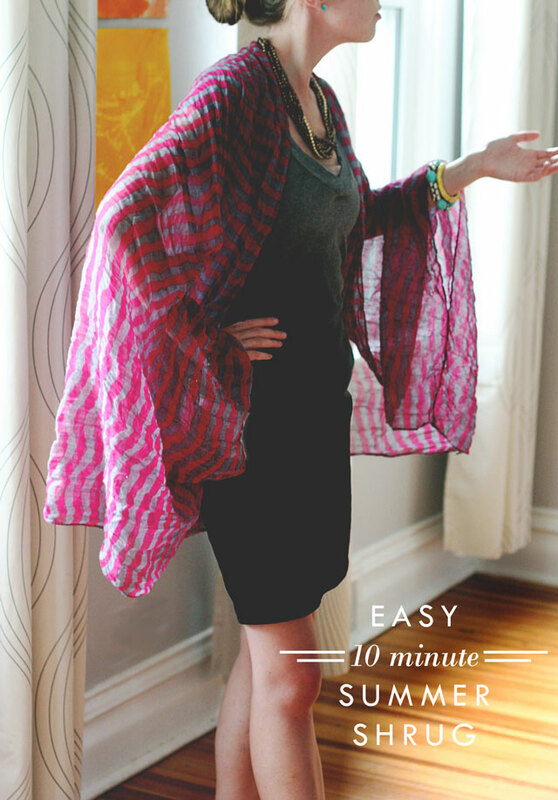 Click here to see the tutorial and check out the fabulous (and very reasonably priced I might add) collection at Scarves.net! Adorable! I’m off to my closet to see which of my many scarves become shrugs! These always look so …nice. I’d forgotten how nice. I had a boss once, who was very swanky. She used to just tie the two corners together on each end and that way you had a shrug when you wanted a shrug and untied, you still had a scarf. Thanks for reminding me. What I would like to know is, how many leopard and animal print scarves do you have? I still need to figure out a better way to wear all my 36 inch square scarves. I was thinking of cutting one of ones I don’t like so much and making an 18 inch by 72 inch scarf. What do you think? I love this! I’m going to order a scarf and make one. I live in the desert southwest with temps up to 110. I want to be cool, but I also need to cover up these arms. Thanks! Damn. That’s brilliant. I have a huge scarf from John Robshaw that is waaayyyyyy to big to wear as a scarf…it’s now going to be a shrug. Sqweeeeeee! Thanks!!! Gorgeous! I’m a necklace hoarder (well, then there are the shoes…). Awesome! Need to get me some of these. Living in deep south Texas, these will be great year-round. This time for real, call the Exorcist! !I read this just after I washed and ironed a bunch of my scarves. My question is, where do you store all of them? It seems like such a sin to have them hiding in a drawer or in a cupboard…….